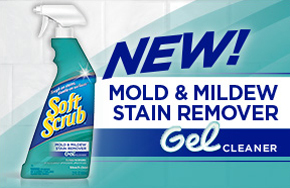 NEW Soft Scrub Mold and Mildew Stain Remover is a unique spray that is tough on stains, and gentle on surfaces. Who is looking for a new bathroom cleaner? Have you been scrubbing that nasty mildew and still having trouble getting rid of it? Look no further your as this Soft Scrub product will have your shower and toilet shining like new. I was using Soft Scrub all purpose and just ran out...lol.